Danny Peterson | 11/21/2017, 2:50 p.m. The increasingly impoverished populations of east Portland are getting some relief this Thanksgiving season as a non-profit dedicated to food and clothing services has opened a second location. A bustling crowd of Portlanders got out of a downpour and huddled inside as the Portland Police Bureau’s Sunshine Division newest location opened last Wednesday from a storefront at 12436 S.E. Stark St.
Kyle Camberg, executive director of the Portland Police Bureau’s Sunshine Division, opens a second location at Southeast 124th and Stark to distribute free groceries and clothes to disadvantaged residents. Sunshine Executive Director Kyle Camberg said the expansion was only made possible thanks “to the generosity and continued commitment of our donors and partners." On opening day last Wednesday, Tanisia Clark, along with a dozen or so other volunteers, helped each patron, one at a time, pick out two bagfuls of clean clothes from a rack of puffy winter coats, shirts, pants, and blazers, and then sent them to the food section where each patron stocked up on several bags of groceries from neatly stocked shelves of canned soup, boxed dinners and frozen food. The Sunshine Division decided to locate in east Portland in response to rising poverty rates in the area, backed up by figures that show a majority of students east of I-205 are receiving free or discounted lunch programs. The Reynolds School District, for example, has nearly 74.7 percent of its students on free or reduced lunches; The Parkrose School District is at 74.4 percent; Centennial School District at 75 percent; and the David Douglas School District has the highest number at 78.2 percent. All of those districts are located on the outer eastern edge of Portland. Other factors, like rising rents, are also hurting more and more low income families. 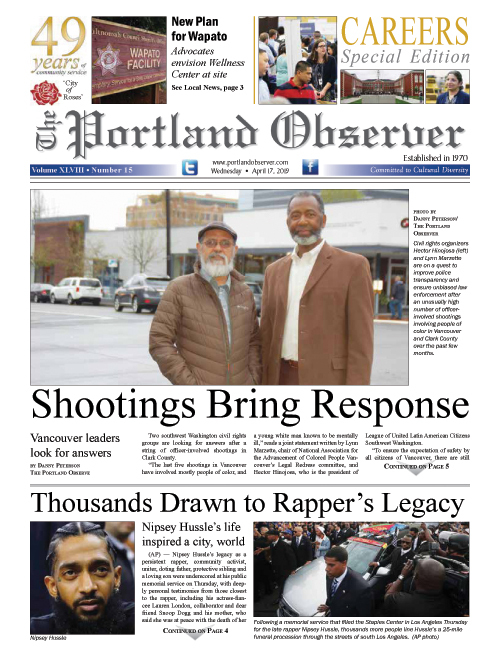 The Sunshine Division’s own surveys showed that many of the patrons that came to its North Thompson Avenue distribution site in the Eliot Neighborhood of inner north and northeast Portland were actually from outer east Portland and Gresham. “And so, without taking a super deep dive, statistically, into, you know, the income numbers, you can just factually know that three-fourths of children that live east of I-205 in the city of Portland face poverty and are dealing with issues of hunger and a lock of resources based on that data alone. It’s pretty startling that the numbers are that high,” Camberg told the Portland Observer. Portland Public Schools, in comparison, only has 46.3 percent of its students on a free or reduced lunch, while suburbs like Beaverton and Tigard hover below 40 percent. Neighborhoods in outer East Portland, meanwhile, are seeing rising numbers of poor folks, larger numbers of ethnic minorities, and more people with lower education than the citywide average. What’s more, a report from the Portland Housing Bureau last year found that the cost of rent has been skyrocketing in east Portland, rising faster than anywhere else in the city the previous year. “People are getting pinched, so the services we provide to families are needed more than ever,” Camberg said. Since 1923, the Portland Police Bureau Sunshine Division has been providing emergency food and clothing relief to Portland families and individuals in need, for circumstances such as the loss of a job, domestic crime, illness, or victims of fire or disaster. The organization will continue existing services at its North Thompson Street location in addition to the new site. Though the Sunshine Division has since morphed into its own entity, a standalone non-profit, they still get assistance from the police to complete their mission and usually have an officer on standby at any of their locations. The new location is anticipated to serve an additional 10,000 low-income families with children, seniors, veterans, and disabled individuals with food and clothing assistance in its initial 12 months of operation. The 124th and Stark Sunshine Division will operate Wednesday through Saturday, 9:30 a.m. to 11:30 a.m. and from 12:30 p.m. to 3:30 p.m.
Other local food and clothing services for the poor include the Oregon Food Bank, Northeast Emergency Food Program, New Hope Baptist Church, Crossroads Cupboard and Salvation Army.